Looking for greater capacity, continuous material flow, and reduced downtime at your heap leach mining operation? Our heap leach conveying systems are designed in a custom, comprehensive manner for peak material handling efficiency. 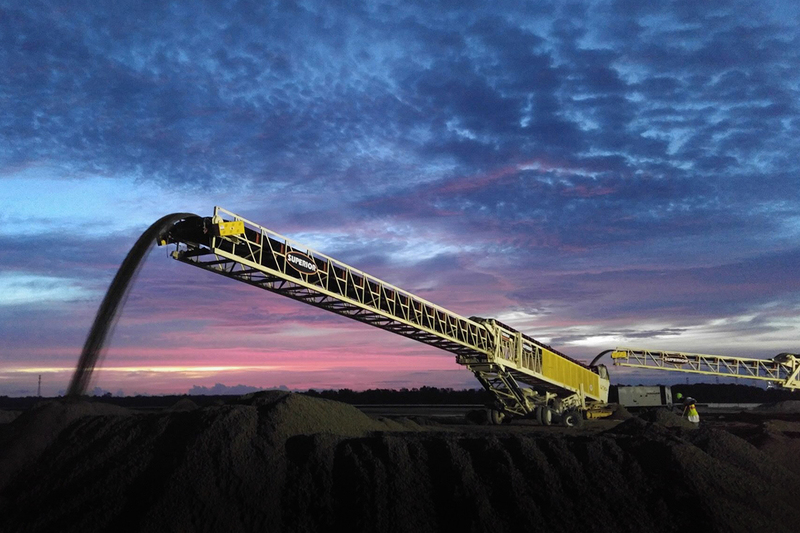 At the core of our system is the mine-duty TeleStacker® Conveyor, which is engineered with an internal stinger conveyor that maintains constant motion along a cell, distributing material evenly to achieve a flat top to each heaped pile, while also piling more material per move. 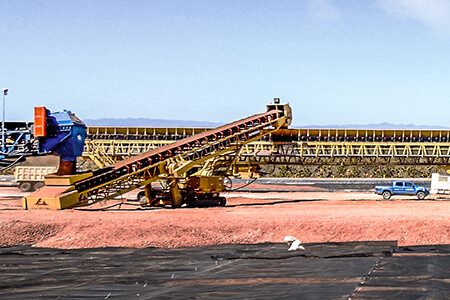 The horizontal index conveyor, a feed conveyor, and multiple grasshopper conveyors are integrated into the system to ensure that a smooth flow of material is fed to the TeleStacker® Conveyor. Each conveyor is engineered with maximum mobility in mind. Our total systems approach takes into account the specific requirements of your operation. 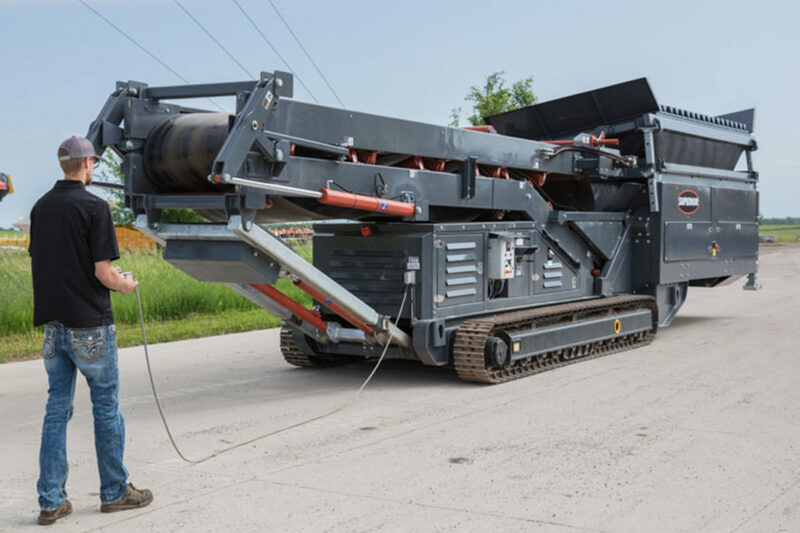 Improve your productivity with a heap leach system from Superior! The tail of this stacking conveyor mounts to the framework of the HIC [Horizontal Index Conveyor] and radially pivots around this point. 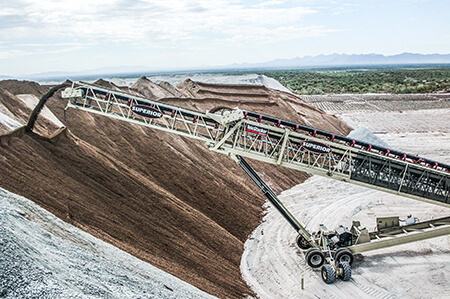 The unit’s stinger conveyor telescopes an additional 30 to 70-ft (9.1 – 21.3m). This allows the stacker to pile more tons per move and creates flat top piles, which reduces reliance on dozers to prep the heap for irrigation. 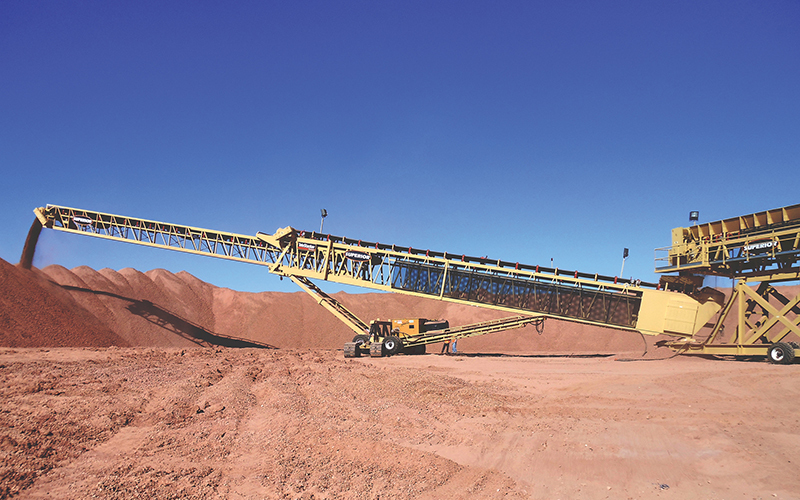 Equipped with a tracked drive, the TeleStacker® Conveyor is mounted to the frame of the HIC [Horizontal Index Conveyor]. The HIC moves itself and the TeleStacker® Conveyor along a cell’s centerline. This fully skirted conveyor is able to accept material feed at any point, which reduces moves and maintains uptime. In between and perpendicular to both the HIC [Horizontal Index Conveyor] and grasshoppers, this portable conveyor transfers material from the grasshoppers and feeds the HIC. Often at least 100-ft (30.5m) in length, grasshopper conveyors move in and out of a production pad based on retreat or advance stacking status. 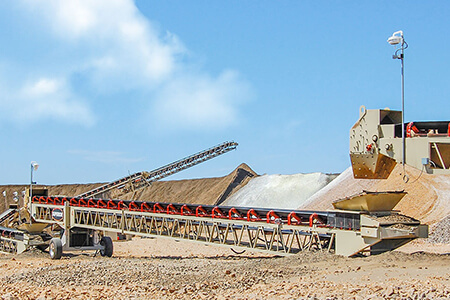 Jarrod Felton, president of Superior Industries, explains how mobile conveyor systems optimize material transfer for greater stacking volume and efficiency in heap leach mining applications. Read his detailed account. Limiting your moves along with limiting downtime are crucial when building a leach pad. Take a look at our ultimate solution! 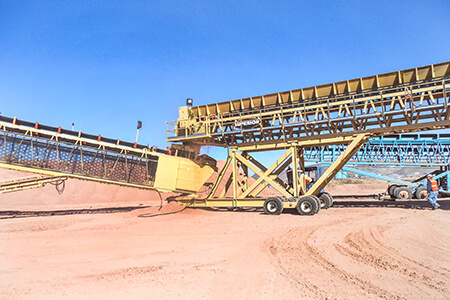 This one-two punch provides the benefits of our TeleStacker® Conveyor all while utilizing our fully skirted horizontal index conveyor (HIC).